So, what can you do about it? Well, you could try a quality liver detox supplement, or you could use some items found at your local health food store, your grocery store, or even some that are already in your kitchen. 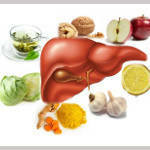 Here is 7 common food items that you can use to naturally detoxify your liver.